Waikato Management School is offering three $3,000 sponsorships for students to take part in the University Scholars Leadership Symposium. Applications close Friday, 3 May 2019. Humanitarian Affairs and the Government of Malaysia are hosting the 10th University Scholars Leadership Symposium (USLS) 1 – 7 August 2019 in Kuala Lumpur, Malaysia. It's a week-long leadership development in social change training programme, bringing together around 1,500 budding change-makers from more than 100 countries. 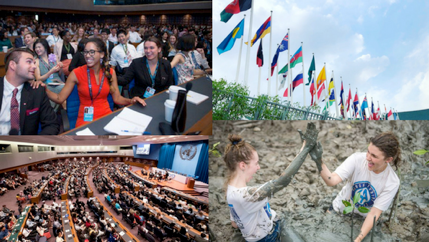 The Symposium offers a platform for young people to come together to discuss leadership, own actions, and to deal with humanitarian and development challenges that the world faces. Delegates will learn what it means to give back to the community and be challenged to respond to the needs of the marginalised with works of kindness and unconditional service. Delegates will have the opportunity to expand their professional network and understanding of world affairs, and be motivated to use their knowledge and leadership skills to impact communities in need. Provide an opportunity to either initiate a sustainable development project or lead a group of volunteers on a humanitarian mission or assist in the various groundbreaking initiatives formulated by other delegates. Delegates will get to engage with some world-renowned life coaches and motivational speakers through talks and interaction. Sponsorship to the value of $3,000 per student will cover registration and travel expenses, the successful applicants will need to cover some costs themselves e.g. visa application and travel/health insurance. Be willing to take photos/videos of your experience in Malaysia, and write a short blog for the WMS website once you return home. To apply please email the information below to Sarah Robson (Student Engagement Coordinator) at sarah.robson@waikato.ac.nz by Friday, 3 May 2019. Successful applicants will be notified by Waikato Management School by 10 May 2019. If you are successful, you'll then be required to complete the official USLS application form by 17 May 2019. Waikato Management School will provide assistance to complete the form, to confirm registration and to arrange travel through the University travel provider.